Boston : Beacon Press, ©1979. Five essays provide an overview of the emerging research program for analyzing contemporary society from a historical and pragmatic standpoint within the rules of empirical science. Communication and the evolution of society. xxiv, 239 pages ; 21 cm. Legitimation problems in the modern state. 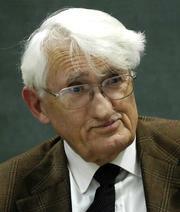 Jürgen Habermas ; translated and with an introd. by Thomas McCarthy. Add tags for "Communication and the evolution of society".